FIFA World Cup @ Brazil – corrupt, wasteful or both? Originally I wrote this as part of the Pantanal blog post but I decided this issue annoyed me enough to actually bother with making it a separate post. On the way out of Pantanal we stopped in the city of Cuiaba. The FIFA World Cup 2014 is going to be in Brazil and Cuiaba is one of the host cities for the tournament. The Brazilian government chose Cuiaba to promote tourism in Pantanal. The World Cup stadium is called Arena Pantanal which is kind of cool since after our little adventure there I feel emotional attachment to this amazing place. When we went to see the new stadium I really started wondering. The stadium was nowhere close to being finished with six months left to the beginning of the tournament. When I looked on the official FIFA page for the stadium turns out the stadium does not have an official completion date. It is possible the website designers decided the date is implied so they cut it out from their masterpiece. However it made me think what happens if a stadium is not really finished in time. I guess as long as the stands, grass and TV cameras are in place it will all look ok? The thing that blew my mind, this brand new stadium is being built to host four games (link). Really FIFA?! Not sure if this is corruption, but it looks wasteful to me for sure. We are talking about building a $210 million USD stadium. The cost per minute of playing time for four games is $583,333 USD in this stadium alone … What happened with frugality and common sense? That big thing on the left side of the picture is half of the roof. Picture from FIFA official website. How Arena Pantanal is supposed to look finished. This entry was posted in Blog and tagged arena pantanal, Brazil, cuiaba, fifa world cup, foothball, money waste, pantanal, rant, South America by George. Bookmark the permalink. Two software developers in love with overland travel. 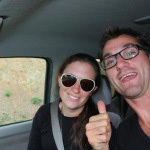 Overlanders that we follow or have run into along the road.